Happy Tuesday, friends! I hope everyone had a great weekend- the temps definitely came back up this week in the Carolinas which made it the perfect opportunity to spend some time outside. On Saturday I attended my friend Katie’s baby shower (tea party themed!) and then Ryan & I went on a little sunset cruise on Lake Norman. Sunday we got some things done around the house then went uptown to watch some of the Panther’s game and just enjoy the fresh air. I’m not trying to wish warm weather away by any means, but I am excited to bust out the fall wardrobe. And fall wardrobe means leggings. 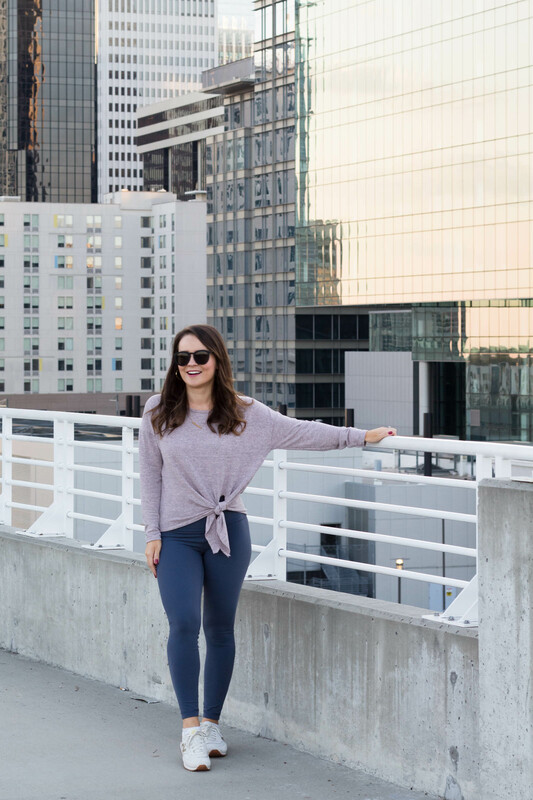 I consider myself a girly girl and love to dress up, but sometimes you just want to be cute and comfy so I’m glad the athleisure trend is here to stay. Would you believe me if I told you this long sleeve tee was under $8?! The tie-front detail is on trend and I love the heathered color. The sizing is one-size but I normally wear and XS and it fits just fine- the tie definitely gives you some leeway. And while the top is a major steal, the leggings are a bit of a splurge but when it comes to Lululemon, it’s 100% worth it. The style is called the ‘Align Pant‘ and they’re my absolute favorite leggings of all time. They feel like butter! They are also high waisted which took some warming up to but the first time I worked out in them I was hooked. I have two pairs of the crops so I figured I should add the longer version to my closet for fall/winter. 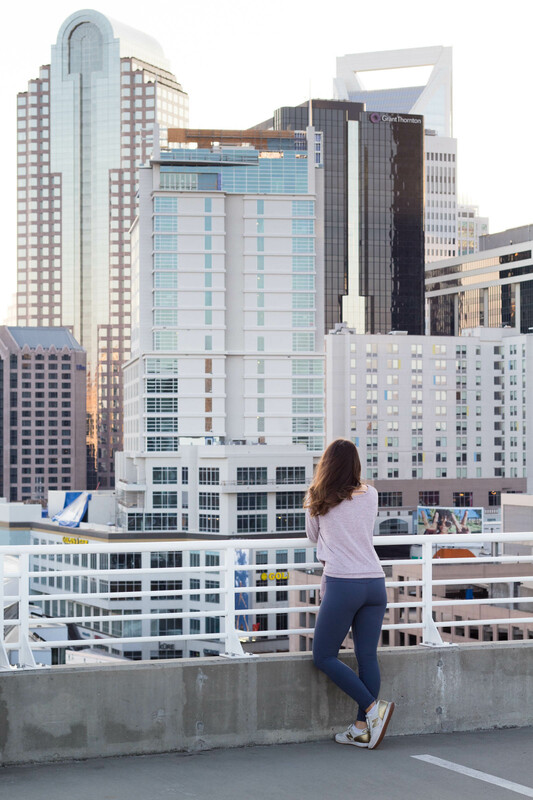 And can we take a minute to talk about the gorgeous Charlotte skyline? I’m a city girl through and through and while I no longer live uptown (but just a short 2.5 miles away), I love seeing how our city continues to grow and thrive. I grew up in a small town and believe it or not, the main reason I chose to attend UNC Charlotte was so I could live in a big city. And I’ve never looked back! There are constantly new restaurants to check out, breweries popping up here and there and countless events to go to. I honestly can’t imagine living anywhere else! What a cute top with so many styling options! This outfit look so comfy and I love the side knot detail. 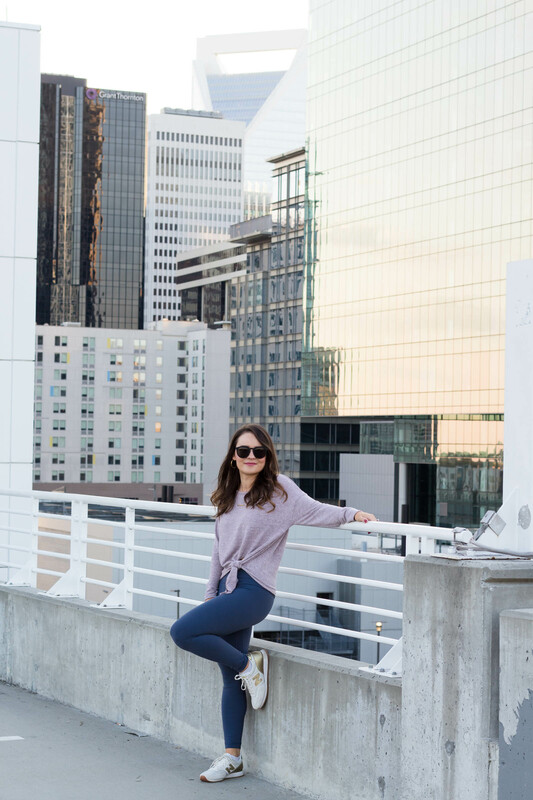 i am loving athleisure so much right now! That top is super cute! I’m impressed with your jump! I keep thinking I’m going to order more athleisure… and then I don’t ever go to the gym… so I postpone it… but really? I’m a huge fan. I can’t say no to a good athelisure #OOTD! So cute! such a cute top! i really do love any tie front! Such a cute look! I love the athleisure trend! That last photo is adorable! 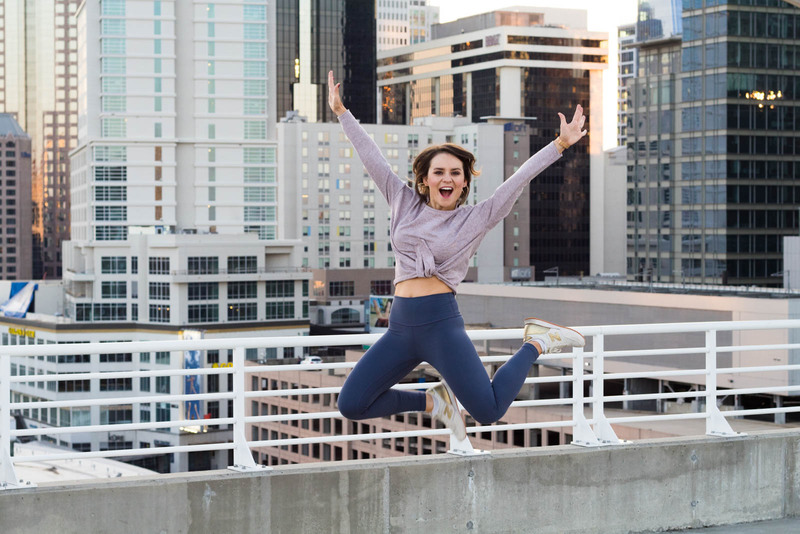 You are rocking the athleisure look girl! So cute! I love the athleisure trend. I love athleisure wear! So pretty – this top looks so soft! You look adorable! I love that cozy top!